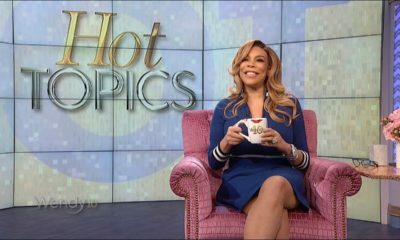 Talk show host Wendy Williams, who only recently returned to her show The Wendy Show after a 2-month hiatus for medical related reasons, is opening up about her addiction related struggles. So, you know me for being a very truthful and open person, and I’ve got more to the story for you. You know, Kevin, Kevin and I have the Hunter Foundation for the good of the people, and we recently launched our 888-5Hunter number for those of you caught up in the struggle of addiction. Well, for some time now, and even today and beyond, I have been living in a sober house. When you see me come to work, glammed up, right after the show I go across the street, I do my Pilates. I told you, two hours a day or like to take care of my body. And you know I’ve had a struggle with cocaine in my past. And I never went to a place to get the treatment. I don’t know how, except God was sitting on my shoulder and I just stopped. But there are people in your family — it might be you — you have been struggling. And I want you to know more of the story. So, this is my autobiographical story, and I’m living it. I’m telling you this. After I go to the Pilates, I go to several meetings all around town in the Tri-state area. And I see my brothers and sisters caught up in their addiction and looking for help. 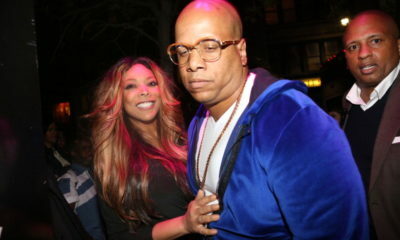 They don’t know I’m Wendy. They don’t care I’m Wendy. There’s no autographs, there is no nothing. It’s the brothers and sisters caught up in the struggle. It’s been really interesting. This ride. Not my parents, nobody. Nobody knew. Because I look so glamorous out here. After I finished my appointments, seeing my brothers and sisters, breaking bread, I am driven by my 24-hour sober coach back to the home that I live in here in the Tri-state with a bunch of smelly boys who have become my family. They hog the TV and watch soccer, we talk and read and talk and read and then I get bored with them. Doors locked by 10:00 p.m. Lights out by 10:00 p.m. So I go to my room, and I stare at the ceiling and I fall asleep to wake up and come back here to see you. So that is my truth. And, um… If you — I know, either you are calling me crazy or the bravest woman you know. I don’t care. If you or someone you know — our Hunter Foundation just launched last week. We have already successfully placed 56 people in recovery centers around the world. Not just the country. It’s 24-hour hotline, seven days a week. Call 888-5HUNTER (888-548-6837). 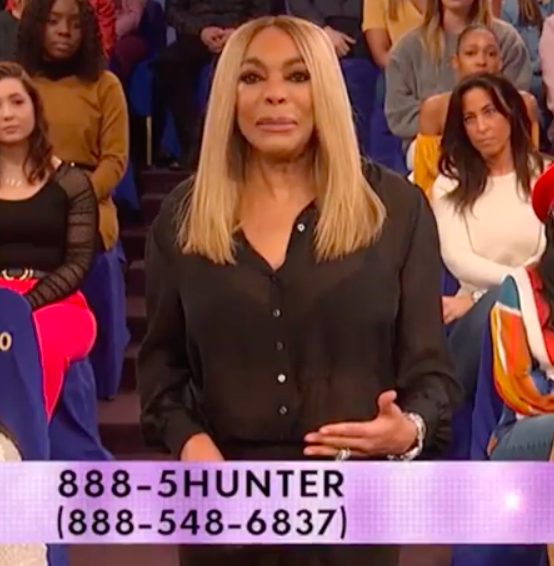 We’re sending love and light to Wendy as she deals with this.